The Dana Dolly Portable Dolly System Rental Kit with universal track ends is a heavy duty camera dolly platform that rides on 16 custom modified soft polyurethane wheels that resist flat spotting and use ABEC-7 rated precision bearings providing you with extremely smooth dolly shots. 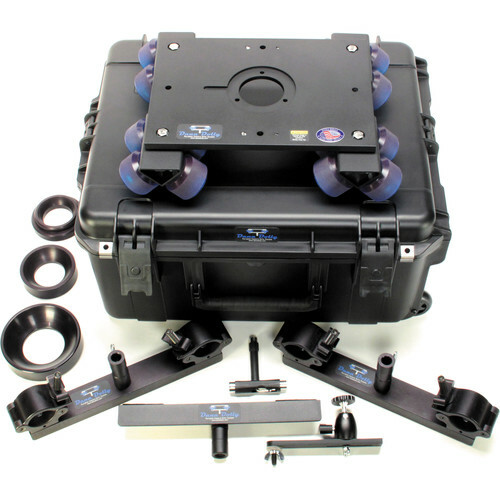 This kit is complete with 75, 100, and 150mm bowl adapters, and comes in a custom flight case. The wheel trucks swivel, allowing the dolly to ride on available straight or curved track, which you must source separately. The manufacturer recommends using standard speed rail or Schedule 80 aluminum pipe of compatible size. The dolly includes two universal track ends, which accept inch and a quarter pipe (standard speed rail) up to 1.9" O.D., and fit into available standard Junior stand receivers or 5/8" Baby pins. A center support is included for long track runs or when using heavy cameras.